Good unused condition. ukp/p 1.25p. Straighten things out, I will try my best to solve your problem. Size: 4cm 3.8cm (big badge). Police, Fire Brigade, Military. The collection include Military Badges, fine military Badge Moulds, Button Fronts, Buckles including non military, Belt fixings, chains, leather/uniforms fixings etc. Four British Army Rank Pips. Brass. Five British Army Rank Pips. Brass. Mostly Associated With Officers Of The 'South Wales Borderers'. A Good Scarce Two Piece Matching Pair Complete. With Original Pins. MADE BY AMMO & CO. LTD. GOLD EMBROIDERED WIRED TYPE THREAD. PRICE IS FOR PAIR. Bulgaria, Canary Islands and Gibraltar. TO BE SEWN ON. Austria, Czech Republic, Finland, Hungary, Lithuania, Norway, Poland, San Marino, Slovakia, Slovenia, Sweden and Switzerland. 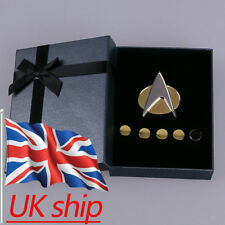 BADGES - CUFFLINKS -AND MUCH MORE. British Officer's Eversleigh Rank Pips x 5 - All marked - JR GAUNT - QUALITY !! All marked - JR GAUNT - QUALITY ! They are of the highest quality and all have the maker's mark : JR GAUNT. Four of them have screw on back plate and nuts. The odd one will accommodate a slit pin. Bronzed finish. Good detail and in good condition for age (probably 1980s-1990s period). Good luck, and we look forward to trading with you in the near future. Red velvet backing. Small size. Diam: 23mm. Three British Army Rank Pips. Brass. I WILL ALWAYS DEAL WITH IT. Excellent detail and are in excellent condition for age (modern era). Good luck, and we look forward to trading with you in the near future. Good luck, and we look forward to trading with you in the near future.